On a drizzly spring afternoon, a group of tourists eagerly waited for their chance to catch a glimpse of the newly restored Darwin Martin House, one of Frank Lloyd Wright’s most celebrated commissions. The building was the most extravagant private residence the architect ever designed. It was also his favorite. The dominating structure that takes up nearly half a city block has become one of Buffalo, New York’s most visited attractions, having recently completed a twenty-plus year, $50-million renovation. Every inch of the complex was refurbished in meticulous detail, from the artfully restored and refabricated glass windows, to the Wright-designed furniture. Buildings that had been demolished decades ago were rebuilt, and the sprawling gardens were reinstated to resemble the prairie tranquility that Wright strived so hard to perfect in the midst of a bustling neighborhood. Today, as the center welcomes thousands of visitors through the newly restored halls, it would be hard to believe that for decades the seven-structure complex sat in disrepair with constant threat of total demolition. It’s restoration, ultimately celebrated as a milestone victory for the city’s preservation community who fought for decades to save the compound. Unfortunately, not all of Wright’s buildings in the city were so lucky. 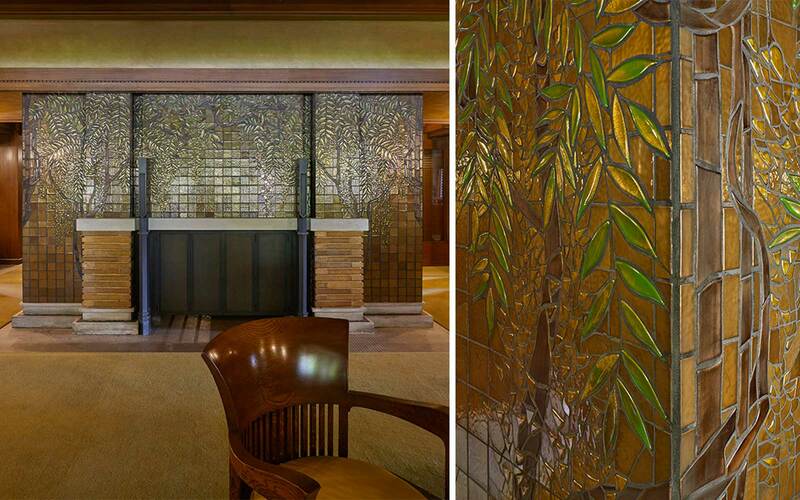 Renovations just wrapped up at the Darwin Martin house, totaling over $50 million over the course of twenty years. I met Mary Roberts, the Executive Director of the Martin House Restoration Corporation that oversees the property, for a private tour as the final guests headed home. Originally from Buffalo, I grew up playing football on the front lawn of the Martin house with my cousins who live only a stone's throw away. It was the first time I had seen the property in nearly 20 years, and it looked nothing like I remembered. The lost buildings have been reinstated, and the untidy lawn replaced with beautiful gardens. When first stepping into the foyer, the expansive interior looked exactly as I’d imagined when the home was first constructed. Furniture is neatly arranged in stylized fashion as if position for an expected party and an assortment of knick-knacks decorate the tables. Thousands of pieces of hand-painted tiles line the fireplace on the main floor. At eye level, the home looks open and expansive, dotted with intricate details. At closer inspection, you notice finite design choices, like hand-painted gold mortar in between the bricks, and the sophisticated ornamentation of the art glass windows. The wall sconces and portions of the ceiling were deliberately lowered to subconsciously encourage people to sit down, where they’d find more nuanced details. Obscured art glass windows and views of the outside garden then come into view. Wherever you stand in the property, you’ll discover new details. Nothing within its walls looks new, in the best possible way. When the Martin House Restoration Corporation formed and took over the title of the property in the early 1990s, there was plenty of work to do. Most of the windows, furniture, and art had been sold off long ago, and portions of the property had been demolished to save money on upkeep. The Martin family had left the property long before having abandoned it in the 1930s, laying the foundation of an uncertain future for the complex. For nearly twenty years the site sat abandoned in the midst of a thriving community, before filtering through the hands of a number of developers and property owners. The Larkin Administration Building before it was demolished in 1950. Over the years, the site was selectively demolished to make way for uninspired, brutalist-style apartment buildings that I’d later play football beside. The remaining portions were changed beyond recognition. The crowning jewel of the property, the glass-encased pergola, was demolished in the 1960s along with the conservatory and carriage house. The belief that the Martin House would ultimately be saved became a more and more distant reality for those in the surrounding community, and the city at large. As the Martin house languished, another of Wright’s more notable buildings met a much worse fate. 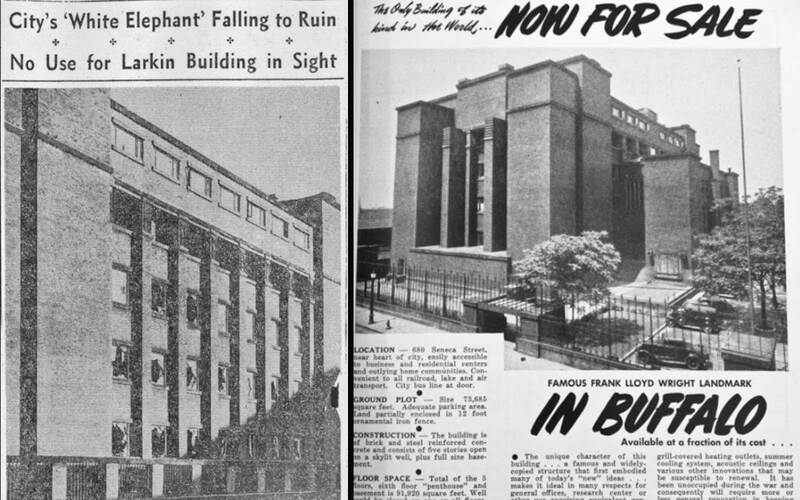 The architect’s first major commission, the Larkin Administration Building — a futuristic office building in the city’s east side, also commissioned by Darwin Martin for the Larkin Soap Company — was demolished to make way for a truck terminal, according to a 1949 clipping from The Buffalo Evening News. The terminal was never built and the site remained undeveloped until it was eventually turned into a parking lot. Wright designed every last detail in his buildings, including the furniture. 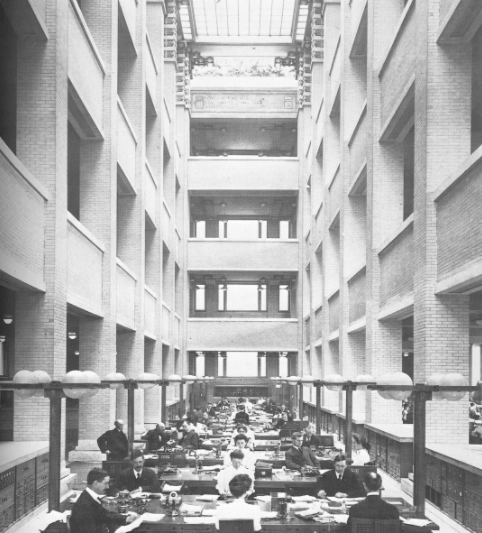 Here, inside the Larkin Administration Building, Wright's attention to detail is apparent. While the architect’s work as a whole was generally celebrated, the reviews of the Larking building were divisive. The simple, yet domineering, front façade made the building look more like a super villain’s lair than an office building, complete with mammoth globes flanking the front entrance. The interior, however, was airy and inviting. A glass atrium contrasted the sturdy brick walls, allowing light to flow in without impedance. Two waterfall fountains greeted guests as they entered, and desks were neatly arranged in a reflective pattern throughout the main floor. The 1950s and 60s saw immense destruction of Buffalo’s historic sites in a failed attempt to modernize the city. Urban flight began to takes its toll as manufacturing plants closed and jobs became more scarce. Over the next fifty years, the city shrunk to less than half of its 1950s population, according to the U.S. Census Bureau. There was little interest in preservation as the focus shifted to keeping the city afloat. 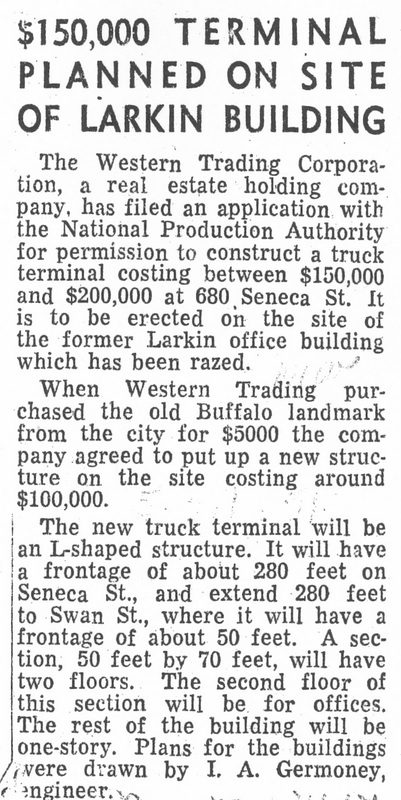 Clippings from the Buffalo Evening News regarding the sale of the Larkin Administration Building. The Larkin Administration Building was one such casualty. As the decades went on and more of the city’s iconic structures fell to the wrecking ball, a resurgence of interest in preservation took hold. The Landmark Society of the Niagara Frontier formed in the 1970s with the sole mission of saving Buffalo’s history. The Preservation Coalition of Erie County and Preservation Buffalo Niagara later formed to join in the fight. The city’s core is now a collection of scattered building and half-empty parking lots, like a gap-toothed smile of missing teeth. But things are changing. The finalized restoration of the Martin house is only the latest in recent investment in the city’s history, and particularly of Wright’s Buffalo. 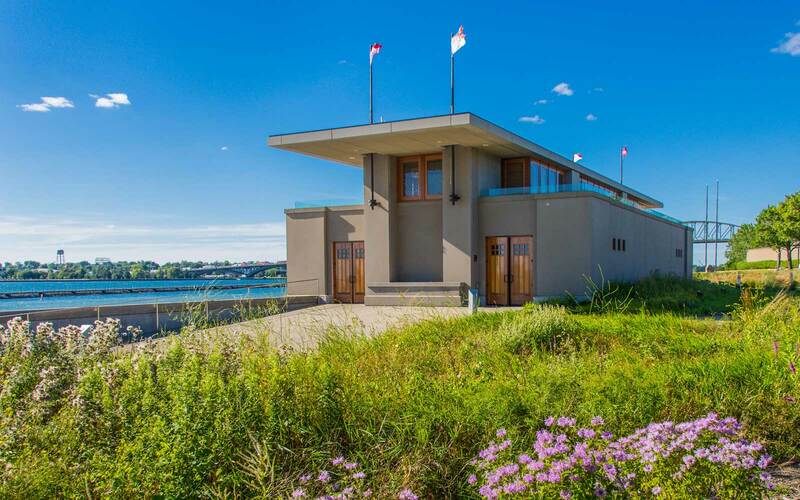 In 2000, a long-forgotten Wright design of a boathouse was unearthed and brought to life a few years later. It was soon followed by two additional designs, including a mausoleum in 2004 and a filling station in 2014. The Frank Lloyd Wright designed Fontana Boathouse on the Buffalo River. Aside from the Martin house, the city lays claim to six other Wright structures, including two private residences. Seven, if you count the Larkin Building. 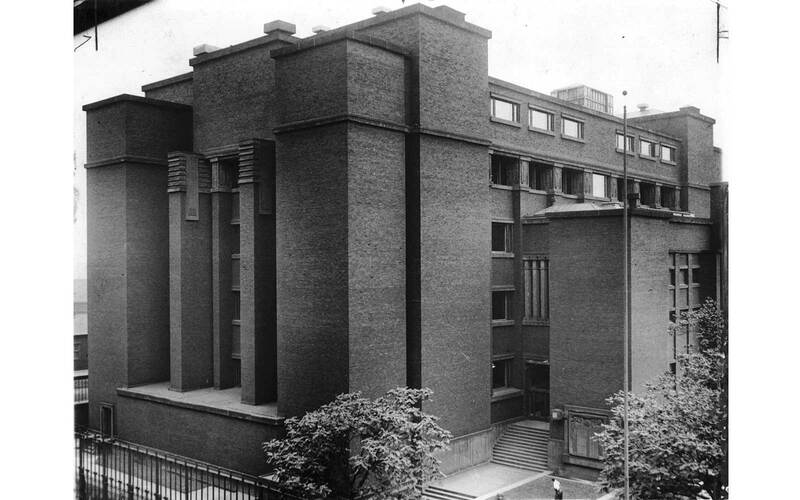 As Roberts guided me through the winding halls and seemingly hidden corridors, she points to the architectural significance of these Wright buildings. She hopes that with the completion of the Martin house and other Wright designs, that Buffalo will finally get the attention it deserves.